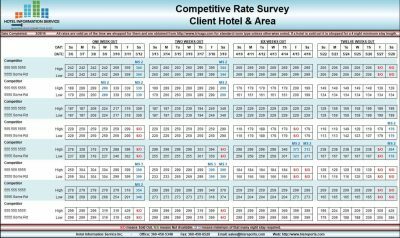 We offer several different types of Competitive Rate Surveys; most are 28 consecutive days out. If you need another format, just ask and we will do everything we can to accommodate your needs. The first type is a one source. If the only requested source is a website, i.e. homepage or online vendor, the hotel is checked for availability one day at a time for 28 days. If requested, we will check for minimum night stays on any sold out dates. 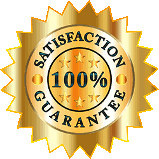 If not specifically requested we don’t, however we will note it if the website states it clearly. Another single source option is calling the hotel directly. For this shop, the hotel is called and availability is requested for Sunday one night, Monday four nights, and Friday two nights, unless otherwise requested. Again, if any minimum night stays are mentioned, we will note them, otherwise we do not. The second of Competitive Rate Survey is a two source. Most often these reports have both an internet source and an in house calling source. In these cases, the internet is checked first and the report is then passed along to a caller. When calling in house after the internet has been shopped, the format is slightly different. The hotels are called in the same date ranges as the availability was listed on line. If the rate is different online for every night of the week, it is called the same way, each night individually. If the rates are broken up throughout the week, i.e. Sunday through Tuesday are the same rate on line, it is called Sunday for a three-night stay. If the rate is identical for 7 days, we will break it down Sunday for one night, Monday for four nights, and Friday for two nights. Another type of CRS is a three source. These have internet, in house calling, and central reservations calling sources. These shops are performed same as above. If a multiple source CRS is requested for all internet sources, i.e. Homepage, Travelocity, Expedia, Hotels.com, Orbitz, etc., each site is checked one day at a time. If a hotel is not listed on a specific site, we make every effort to locate it, trying different name options. Per 4 seven consecutive day data parcels. We are in the business of helping you maintain your competitive edge. If you are not satisfied with your report, just call us within two weeks of receiving your report and we will work with you to fix any issues that you may have with it. This ensures that you are getting the accurate information you need. Our turnaround time is QUICK! If you request a certain deadline, we will do our best to meet it. Usually shops are completed within a week of ordering, most of the time however, it is sooner. ©2016 - 2018 Hotel Information Service. All Rights Reserved. Our newsletter gets sent out about once a month within the last few days before the first of each month and contains BIG discounts!